The verdict for going heavy on deadlifts and reducing stress on the lower back. The deadlift is the ultimate test of overall body strength. 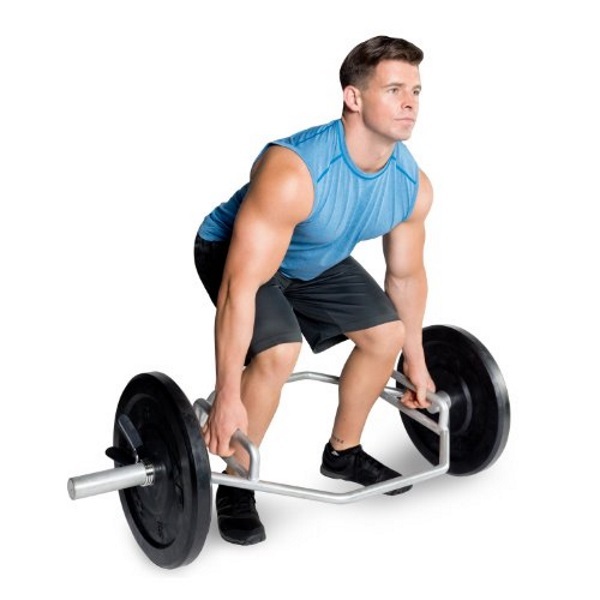 While the main way to do deadlifts is using a standard Olympic bar, more guys today are doing deadlifts using the hex bar, which is a hexagon-shaped bar that you stand in the middle of. It’s often referred to as a “trap bar,” since many bodybuilders do shrugs with it. The barbell deadlift is the proper way to perform the deadlift. That’s how it’s performed in competitions, so do deadlifts the way the pros do them. do deadlifts, and the method used in deadlift competitions, many guys find that doing deadlifts with a hex bar is less stressful on the back and more comfortable overall. of competitive powerlifters when they did deadlifts with an Olympic bar and a hex bar. They reported in the Journal of Strength and Conditioning Research that when test subjects did the hex bar deadlift, they were able to lift an average of almost 50 pounds more than when they did the deadlift with the barbell. The U.K. researchers further reported that the hex bar deadlift placed less stress on the lower back. on deadlifts as well as for reducing stress on the lower back.